Used with string or thin sealing wire. 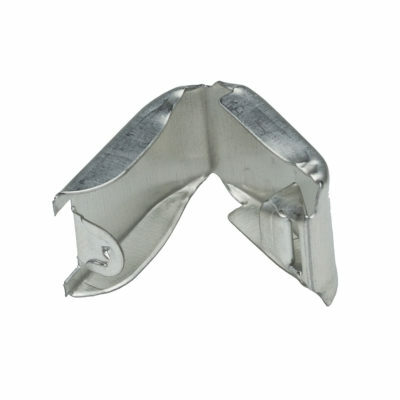 Clipseal, a fixed closing security seal solution, with all metal parts made of sheet metal and having the posibility of a variable length of metallic, plastic or rope wire closure surounding your goods, for security reasons, which ensures a high sealing safety at tensions and flexing resistance. They represent the ideal solution for sealing the pallets carried by trucks in the custom transit or any need of having security check or access on the packaged foiled or boxed goods. 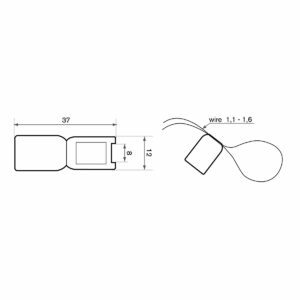 This security solution is working by having a tightening wire closure around your goods or object to be security checked and with clip seal protecting your closure. In this way tampering the closure is straight forward evident. Fixed closing tin seal tend to be more tamper resistant than variable length security seal as there are no sliding parts, they simply ‚click‚ into place to lock, which can make them easier to fit than variable length seals. Most fixed closing tin seals can also be branded, laser or mechanical writing, and numbered for extra security. Fixed closing security check and control access is often the choice of single use security seals for transport applications or security areas which request a high degree of mechanical tight of closure where the plastic security seals can not fulfill the specific security request. Clipseal belong to metal seals group of security seals (Метални пломби, Metalne sigurnosne brtve, Μεταλλικές σφραγίδες ασφάλειας, Fém plombák, Sigilli di sicurezza metallo, Metallplomben).